Michael Baker was a place kicking centre who, as a 16 year-old Marling schoolboy, was one of Gloucester’s youngest ever players. He played 179 games for Gloucester between 1949 and 1957. He also played for Gloucestershire and the RAF and after leaving Gloucester played for Weston-super-Mare, captaining them in 1960-61, his last season. Michael James Passmore Baker was born in Gloucester on March 20, 1932. His family moved to Cainscross and he was educated at MarlingSchool, Stroud. While at Marling he played for Gloucestershire Schoolboys and had an England Under 14 trial. He enjoyed all sports and was a successful athlete, cricketer and oarsman. After playing for Cainscross, Mike joined Gloucester for the 1948-49 season and made his United debut against Cardiff at the ArmsPark. On his debut for the 1st XV against the RAF at Kingsholm eight days before his seventeenth birthday, the Citizen said: Michael Baker the Marling schoolboy made a promising debut in the centre. He showed that he can give and take a pass and with more experience of first class football should make good. The following October, still only 17, he scored a try which the Sunday Dispatch described as “copybook” in a 12-0 victory over Richmond at Kingsholm and in December at the Rectory Field scored all the points (try, conversion and penalty) in an 8-3 victory over Blackheath. Now a regular 1st XV choice, he received his badge for 25 games soon after his 18th birthday. Mike was called up to do his National Service in the RAF late in 1950 and served at RAF Langtoft in Lincolnshire. While there he played for the RAF against the Army at Twickenham in March 1951 and against the French Air Force the following season. He also played for Lincolnshire while stationed at Langtoft and played occasionally for Gloucester, when available. 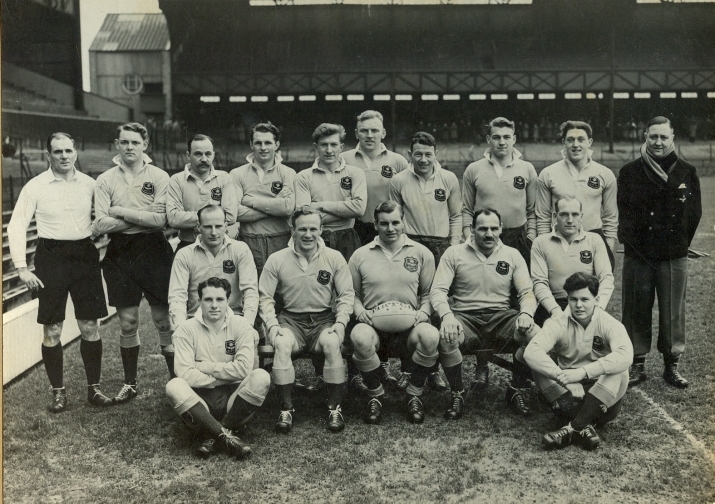 Mike Baker rejoined Gloucester late in the record-breaking 1951-52 season, dropping a goal in the 14-0 victory over Cardiff at the end of February. He then scored a dropped goal and converted the only try as Gloucester beat Llanelly 8-5 in the closing minutes at Kingsholm on April 19 to become the only English side to beat them that season. In a memorable match at Swansea the following season he kicked two conversions in a rare 10-8 victory (two goals to a goal and a try) and the following week played in a 14-9 victory over Cardiff at Kingsholm. Mike had been noticed by the Gloucestershire selectors and had played in a county friendly against Glamorgan in April 1951. Now demobbed, he was chosen to play for Gloucestershire against Devon at Exeter on October 11 1952, but this was to be his only CountyChampionship appearance, although he played in further early season friendlies against Glamorgan and British Police. He was Gloucester’s leading scorer in both 1954-55 and 1955-56, but broke his leg in 1956 and his subsequent appearances for Gloucester were limited. His job with Barclays Bank took him to Somerset the following year. He joined Weston-Super-Mare RFC and played for them to the end of the 1960-61 season, in which he was club captain.